You could say that my first interest in Hard Rock Cafe began in the early 1990's when my supervisor would visit many worldwide cities due to his line of work. I always asked him to pick up a tee-shirt if he had the time as I thought it would be nice to have a collection of the various locations he visited & a few years later I visited my first cafe in Atlanta in the spring of 1993. Now everytime a friend would travel I would ask them to pick up a shirt for me. After a few years I had a decent tee-shirt collection w/hopes of visiting more cafes on my own to increase my new hobby. It wasn't until the late 90's that I noticed that each cafe had it's own guitar pins available. As I traveled the USA on job interviews I made sure to stop by the local cafe & pick up some pins as a token of my visit. It wasn't until 1998 that the interest of picking up pins became an obsession as my local Cleveland Hard Rock Cafe opened & I realized through the internet that were worldwide pin collectors out there! I would make repeated trips to my cafe picking up pins/shots/shirts for myself & others as I tried to get more involved in this hobby. For the first 6 months or so I tried to collect every pin from every cafe that was issued but I quickly realized that I couldn't afford it so I concentrated on just guitars. I came across the First Edition of the Pin Collectors Guide from 1996 & decided that I was going to collect pins from this guide as it mostly contained guitars. Since then I have chased these older pins for I feel they are the backbone of what this hobby is today & my website for the most part reflects this. Even today I am still looking for early pins from London, Tokyo, Stockholm & Reykjavik to name a few locations. I try to keep up to date on all First Anniversary/Staff pins & keep my eye out for those classic horizontal Les Pauls & old city guitars to name a few. I try to keep this site current but w/new locations openings, pins being traded & my wishlist constantly growing it can be tough. If you see something from my trader list or have some pins (few to a collection) that I am looking for please feel free to send me an email. Lets help one another!! Today I live in the greater Los Angeles area where I am close to the two Hollywood locations. I have met many great people in this hobby from online trading or just meeting them at events such as Pinsanity or making road trips from cafe to cafe. 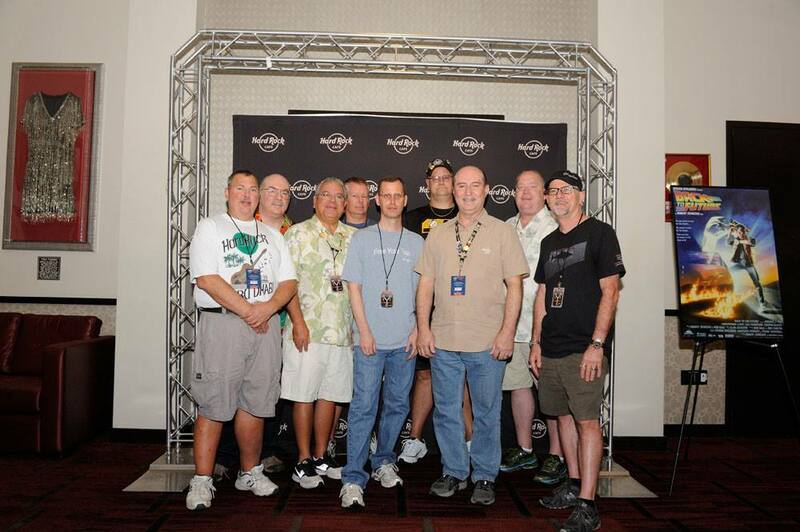 PinSanity 2015: (left to right) Willie Schmidlin, Dave Nathan, Jim Haron, Myself, Scott Stewart, Mike Terrill, Mark Zeoli, Roger Lemke & Chaz Brunton.